The 1959 Willys Special Maverick Station Wagon weighed in at 3,900 pounds. It sold for $2,944 f.o.b. Windsor. Independent automaker Willys-Overland could reach right back to 1903 as the beginning of its heritage. When the fledgling Indianapolis firm ran into trouble, John North Willys bought the Overland concern to keep it afloat. In a bid to speed up production and fill back orders, the company began manufacturing vehicles under a circus tent. The higher-priced Willys line was soon introduced as a companion car for Overland and it found success with consumers, too. With a decade of success under its belt, the company cast its eye on expanding into the Canadian and British Empire markets. Willys-Overland set up shop in Hamilton, Ontario in 1914 and began producing cars. A year later, Willys-Overland bought two-thirds of the luxurious Russell concern from CCM and moved to Toronto. Automobiles were built in 1916 and 1917 but the Great War brought military contracts. Auto production ceased in 1918 in order to built aircraft engines. Civilian products returned in February 1919 with the introduction of a light car. Throughout the 1920s the company’s products were popular with consumers and in 1926 the previously imported top-of-the-line Willys-Knight was domestically produced. The same year Willys-Overland Canada began to fabricate its own bodies, no longer contracting them from Canadian Top & Body in Tilbury, Ontario. The Dirty Thirties took its toll on all the automakers and executives closed the doors of the Toronto plant in 1933. Vehicles were imported from the US after that. In 1934 the head office was moved from Toronto to Windsor and took up residence on Giles Street, next door to Hupp. John North Willys died in 1936 and the firm was reorganized. There was talk of reopening a Canadian plant but it never happened. When war broke out in Europe in 1939 any talk of domestic Willys-Overland production was mothballed. The parent company picked up a contract to build the Jeep during World War Two. The rugged little vehicle earned its keep on battlefronts around the world. Willys-Overland executives were keen to find civilian applications for the war hero in a peacetime world. Industrial designer Brooks Stevens had the same idea and created several automobiles based on the Jeep chassis and drivetrain. He sold his ideas as a story to a magazine. The folks at W-O were impressed and asked him to come to their Toledo headquarters. Stevens left Toledo with a contract. Cashing in on the Jeep’s image was the key to success. The station wagon did that perfectly. Because none of the big body makers would stamp parts for Willys-Overland, draw was kept to six inches and punched out by a company that made refrigerators. The indentations in the side panels strengthened the envelope. It was practical to the point of being utilitarian but it held seven passengers and could carry 96 cubic feet of cargo. When the product appeared on the market in 1946 it was the first all-steel station wagon in automotive history. It sold well and a Panel Delivery joined the lineup a year later. In 1948 a more upscale Station Sedan was added. So was a six-cylinder engine. For 1949 a four-wheel drive version was introduced. The front end was restyled for the 1950 selling season. The postwar market created fierce competition among the automakers. The independents scrambled for market share as Ford went after archrival Chevrolet, guns a-blazing. To stay alive, the small companies began to amalgamate in hopes of survival. Willys-Overland was first; it merged with Kaiser-Frazer in April 1953. The operation in Windsor, Ontario had been solely oriented to service and sales. Willys of Canada Limited moved into new headquarters in 1953. A small department outfitted already completed Jeeps, shipped in from Ohio, with accessories and modifications needed to do special jobs such as fire and rescue work. 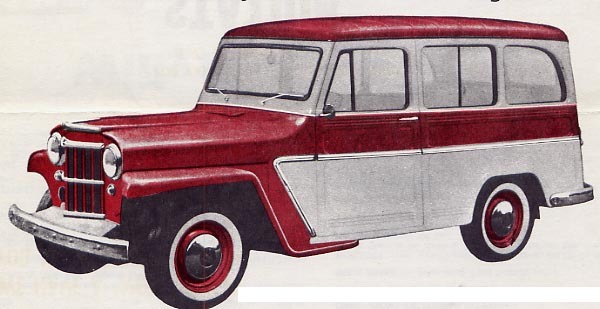 In 1955 domestic assembly of 4x4 Jeeps began. The Willys Station Wagon was still imported, however. For 1959 a special Maverick model bowed, making its first appearance on May 7, unveiled to millions of viewers watching the popular Maverick television show that Kaiser-Willys just happened to sponsor. Truly posh by Jeep standards, the Maverick sported two-tone paint, wore lots of chrome, was shod with white wall tires, blessed with interior carpeting—albeit black--and a one-piece windshield. Its list price was $2,944 f.o.b. Windsor. Advertising bragged that the Maverick was “Canada’s lowest priced, full size station wagon” and that it was worth a look because it combined “the ruggedness, dependability and quality of the Jeep with the smoothness and good riding qualities of the passenger car.” Not willing to miss any possible market, the Maverick was touted as the ideal family and business station wagon. Doctors, teachers, veterinarians were all urged to consider the Willys, especially those who lived and worked in rural areas. Farmers and ranchers were pleased with its high clearance fenders. Folks wanting to rough it out in the country could carry up to a half ton of camping gear, guns, fishing tackle and oh—the wagon could sleep two and save putting up a tent! Still the basic package since its 1946 introduction, the Willys was powered with a 75-horsepower Hurricane F-head four-cylinder engine, though a 105-horsepower Super Hurricane L-head six was available at extra cost. By the time the Station Wagon was retired in 1962, it been in production for sixteen years and done Willys proud. Its successor would also come from Brooks Stevens and usher in a whole new kind of driving experience. Nice catch with history here.It is nice to have the old styles come up with new and advanced mechanisms.Love the new features of the car these days.